Today, I begin a new article series on the site: a monthly look back on that magazine and the comics market in those tumultuous times, starting with...what else? 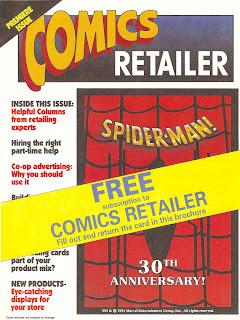 An origin story, discussing both the origins of the comics retail market, the demand for the magazine, publisher Krause Publications' intentions for it, and some of the issues facing the market in 1992, when the publication was launched. This installment closes with my arrival in the CR offices in November 1993, and the challenges the market was facing at the time. The plan (at least roughly) is for a continuing series, hopefully monthly, looking back at individual months as the 1993 boom went bust. Be sure to follow Comichron on Twitter and Facebook, and check out our Youtube channel.